The Shōwa period (昭和時代, Shōwa jidai, "period of enlightened peace"), or Shōwa era, is a period of Japanese history that coincides exactly with the reign of Emperor Shōwa (Hirohito), from December 25, 1926 to January 7, 1989. It was the longest reign of any Japanese emperor. The Shōwa period was an era during which Japan turned to militant nationalism, saw numerous cities burned to the ground in a military defeat, and then enjoyed a blossoming postwar economy. During this era, Japan also descended into political chaos as the momentary collapse of capitalism and looming threat of communism gave rise to ultranationalism. In 1937, it engaged in war with China for a second time and in 1941, it entered the world-wide conflict of the Second World War by attacking the United States at Pearl Harbor. In early August 1945, it was the site of the only two atomic bomb attacks in history to date. 3 The end of "Taishō Democracy"
After World War II, Japan was occupied by a foreign power for the first and only time in its history, an occupation that lasted seven years. The American occupation initiated sweeping democratic reforms. The 1960s and 70s brought about an economic miracle, during which Japan became the second largest economy in the world. In the Japanese language, the name “Showa” means “bright peace” or "enlightened peace." (Showa and Shouwa are alternative Romanizations.) It is correctly pronounced sho wa, with an elongated “o” in the first syllable. Though the Showa was preceded by the Taisho period (1912–26) and succeeded by the Heisei period (1990– ), neither of these is widely associated with the history of Japan during the twentieth century. The term “Showa literature,” refers to a distinct phase in Japanese literature which lasted from about 1924, until the outbreak of World War II in 1939. The Great Depression of the 1930s, which was particularly severe in Japan, is referred to as the "Showa Depression." The period from the enthronement of Hirohito in 1926, to the end of World War II in 1945, is referred to as the early Showa period. Defeat in the Second World War brought about cataclysmic change. For the first and only time in its history, Japan was occupied by a foreign power, an occupation that lasted seven years. The American occupation initiated sweeping democratic reforms and in 1952, Japan became a sovereign nation once more. The 1960s and 70s brought about an economic miracle similar to that which took place in West Germany. Japan became the second largest economy in the world, and it seemed for a time that Japan would ultimately overtake the United States as an economic superpower. Due to the nature of Japan's culture, landscape, and history during this period, it is useful to divide the period into at least three parts: The militarist period, the American occupation, and the post-occupation era. One might add to those three distinctive eras the period in which the Taishō democracy declined and fell, as well as the period in which Japan fought the Second Sino-Japanese and Pacific wars (which, however, can be considered part of the militarist period). The end of "Taishō Democracy"
During the reign of the relatively weak Emperor Taisho (1912-1926), political power shifted from the hands of a small oligarchic clique (genro) to a democratic parliament and political parties. During World War I, Japan joined the Allied powers and played a minor role in fighting German colonial forces in East Asia. At the Paris Peace Conference of 1919, the United States rejected Japan's proposed amendment of a "racial equality clause" in the covenant of the League of Nations, epitomizing the arrogance and racial discrimination which had plagued Japanese-Western relations since the forced opening of the country in the 1800s. During the decades preceding World War II, relations deteriorated further. In 1924, for example, the United States Congress passed an Exclusion Act prohibiting any more immigration from Japan. Japan's economic situation worsened after World War I, and the Great Kanto Earthquake of 1923, and the world wide economic depression of 1929 intensified the crisis. The election of Kato Komei as Prime Minister of Japan continued democratic reforms that had been advocated by influential individuals on the left, which culminated in the passage of universal manhood suffrage in March 1925. All male subjects over the age of twenty-five were given the right to vote, provided they had lived in their electoral districts for at least one year and were not homeless. The electorate suddenly increased from 3.3 million to 12.5 million. Pressure from the conservative right, however, forced the passage of the Peace Preservation Law of 1925, along with other anti-radical legislation, only ten days before the passage of universal manhood suffrage. The Peace Preservation Act severely curtailed individual freedom in Japan by outlawing groups that sought to alter the system of government or to abolish private ownership. This, in addition to internal fragmentation, contributed to the dispersal of the leftist movements that had been galvanized by the Russian Revolution of 1917. Conservatives forced the passage of the Peace Preservation Law because the party leaders and politicians of the Taisho era felt that, after World War I, the state was in danger from revolutionary movements. The Japanese state had never clearly defined a boundary between private and public matters and therefore demanded loyalty in all spheres of society. Consequently, any ideological attack, such as a proposal for socialist reforms, was viewed as an attack on the very existence of the state. After the passage of the Peace Preservation Law and related legislation, kokutai (national policy recognizing the supreme authority of the emperor) emerged as the symbol of the state. Kokutai was seen as a barrier against communist and anarchist movements in Japan, and presented a considerable challenge to parliamentary democracy in Japan. Prior to the Meiji Restoration of 1868, most Japanese more readily identified with their feudal domains rather than with the idea of "Japan" as a whole. When the Tokugawa bakufu was overthrown, the leaders of the revolt, who came from the provinces of Satsuma and Chōshū, had been ideologically opposed to the house of Tokugawa since the Battle of Sekigahara (October 21, 1600). During the Meiji period, through the introduction of mass education, conscription, industrialization, centralized government, and the waging of several successful foreign wars, Japanese nationalism began to foment as a powerful force in society. Mass education and conscription supplanted loyalty to feudal domains with loyalty to the state. Industrialization and centralization gave the Japanese people a strong confidence that Japan would one day be equal to the Western powers, and military success in foreign wars gave the populace a sense of national pride. Some Japanese conservatives saw a need to temper the rapid industrialization of Japan, which they felt was becoming too "Westernized," and feared the loss of something intrinsically “Japanese.” During the Meiji period, nationalists had protested against the unequal treaties with foreign powers; in the years following the World War I, Western criticism of Japanese imperial ambitions and restrictions on Japanese immigration changed nationalism to a xenophobic form of ultra-nationalism which focused on the emperor and Asia. Japanese nationalism was rooted in the pre-modern concept of bushido (warrior ethics) and tempered with a modern concern for strategic dominance in East Asia. It regarded the Triple Intervention of 1895 as a threat to Japanese survival in East Asia and warned that the "ABCD Powers" (America, British, Chinese, and Dutch) were threatening the Empire of Japan, and that the only solution was conquest and war. After the Great War, the Western powers, influenced by Wilsonian ideology, attempted an effort at general disarmament. At the Washington Naval Conference of 1921-1922, the Great Powers met to set limits on naval armament. The Five Power Naval Limitation Agreement, worked out in Washington, limited quantities of battleships and aircraft carriers to a ratio of 5:5:3 for the United Kingdom, the United States, and Japan respectively. Japanese ultra-nationalists viewed this as an attempt by Western powers to curb Japanese expansionism in an area of the globe over which they had no interest. Those in power in Japan readily agreed to the disarmament, realizing that the global interest in war had diminished after the First World War and confident that the ratio was sufficient for Japan to maintain hegemony in the Pacific. In 1924, however, relations between the United States and Japan were soured by the passing of the Immigration Act of 1924 (Japanese Exclusion Act). The act, passed by Congress in response to complaints from the Governor of California, closed off Japanese immigration to the United States and was symptomatic of the mutual misunderstanding that the two nations had for one another. From 1928-1932, domestic crisis could no longer be avoided. As the left was vigorously put down by the state, the Great Depression brought new hardship to the people of Japan. Silk and rice prices plummeted and exports decreased by 50 percent. Unemployment in both the cities and the countryside skyrocketed and social agitation came to a head. Meanwhile, the London Naval Conference was held in 1930, to extend the Washington Treaty System. The Japanese government had desired to raise their ratio to 10:10:7, but this proposal was swiftly countered by the United States. Thanks to back-room deals and other intrigues, Japan walked away with a 5:4 "advantage" in heavy cruisers, but this small gesture did not satisfy the populace of Japan, which was gradually falling under the spell of the various ultra-nationalist groups agitating throughout the country. On November 14, 1930, Prime Minister Hamaguchi Osachi was assassinated by a member of Aikoku-sha, an ultra-nationalist secret society dissatisfied with the outcome of the London Naval Treaty. By this time, the civilian government had lost control. A New York Times correspondent called Japan a country ruled by "government by assassination." In the summer of 1931, the army, acting independently of the proper government of Japan, took the opportunity to invade Manchuria. Since the Russo-Japanese War of 1905, Japan had had a military presence in Manchuria. After a small explosion on the tracks of a Japanese railway, north of Mukden, the Japanese army mobilized the Kwangtung Army and attacked Chinese troops. The Minseito government, headed by Hamaguchi's successor, Wakatsuki Reijiro, was unable to curb the army's offensive. The Kwangtung Army conquered all of Manchuria and set up the “independent” puppet state of Manchukuo. The Japanese air force bombed Shanghai, ostensibly to protect Japanese residents there. The Diet, now dominated by army officials, voted to withdraw from the League of Nations. The first seeds of the coming conflict had been sown. During the 1930s, the military took almost complete control of the government. Political opponents were assassinated, and indoctrination and censorship in schools and the media intensified. Most of the important government positions, including that of the Prime Minister, were occupied by army and navy officers. Japan’s withdrawal from the League of Nations in 1933, after the invasion of China, meant that Japan now stood alone, without allies and under international condemnation. Popular nationalism was out of control. Local leaders, such as mayors, teachers, and priests, were recruited by the various movements to indoctrinate the people with ultra-nationalist ideals. They had little time for the pragmatic ideas of the business elite and party politicians; their loyalty was with the Emperor and the military. In March of 1932, the "League of Blood Incident," in which an ultra-nationalist extremist group attempted to assassinate twenty wealthy businessmen and liberal politicians (only two of their targets lost their lives), and the chaos surrounding the trial of the conspirators, further eroded the rule of law in Showa Japan. In May of the same year, during an attempted coup d’etat, a group of eleven right-wing Army and Navy officers, mostly in their teens, assassinated Prime Minister Inukai Tsuyoshi at his residence. The plot fell through and the assassins surrendered themselves to police, but received such a light sentence that it was clear that the political parties no longer ruled Japan. From 1932-1936, the country was governed by admirals. Mounting ultra-nationalist sympathies led to chronic instability in the government, and moderate policies were difficult to enforce. The crisis culminated on February 26, 1936, when about fifteen hundred ultra-nationalist army troops marched upon central Tokyo, intending to assassinate the government and promote a "Showa Restoration." Prime Minister Okada survived the attempted coup by hiding in a storage shed behind his house, but the coup only ended when Emperor Hirohito personally ordered an end to the bloodshed. Within the state, the idea of a Greater East Asian Co-Prosperity Sphere began to take hold. The ultra-nationalists believed that the "ABCD powers" were a threat to all Asians and that Asia could only survive by following the Japanese example. Japan had been the only Asian (and, indeed, non-Western power at the time) to successfully industrialize. While largely described by contemporary Western observers as a front for the expansion of the Japanese army, the concept of the Co-Prosperity Sphere was that Asia would unite against Western imperialism under the auspices of the Japanese. The idea was rooted in the paternalistic aspects of Confucianism. In 1937, Japan drew its people into war once more. On July 7, 1937, the Japanese Kwangtung army, stationed at the Marco Polo Bridge, used explosions heard on the Chinese side of Manchuria as a pretext to invade China and launch a full-scale war, acting independently of a more moderate government. At the time, China was divided internally between the Communist Party of China (CPC) under the leadership of Mao Tse Tung, and the Nationalist government of China, the Kuomintang (KMT) under the leadership of Chiang Kai-shek. The Japanese had a number of advantages over the Chinese army and were far ahead of China in the development of mechanized warfare (tanks, motorized transport, and planes). The Japanese slaughtered the elite 29th Army at Kupeikou and quickly occupied Peiping (Beijing) in late July 1937. From there, the Japanese advanced south along the major railway lines (Peiping-Suiyan, Peiping-Hankow, and Tientsin-Pukow), which were easily taken by the superior force of the Japanese army. The Japanese forces succeeded in occupying almost the whole coast of China and committed war atrocities on the Chinese population, especially during the fall of the capital Nanking. By October, Chiang Kai-shek's best armies had been defeated at Shanghai, and by the end of the year, the capital, Nanking had also been seized. By 1939, the Japanese war effort had reached a stalemate. The Japanese army had seized most of the vital cities in China, possessing Shanghai, Nanking], Beijing, and Wuhan. However, the Chinese government never surrendered completely, and the war continued on a lower scale until 1945, as the Nationalists and the Communists, fought on from Chongqing and Yenan respectively. Negotiations for a German-Japanese alliance began in 1937, with the onset of hostilities between Japan and China. In 1940, Japan occupied French Indochina (Vietnam) through an agreement with the French Vichy government, and on September 27, 1940, the Tripartite Pact was signed with Germany and Italy, creating the Rome-Tokyo-Berlin Axis. These actions intensified Japan's conflict with the United States and Great Britain which reacted with an oil boycott. The resulting oil shortage and failures to solve the conflict diplomatically made Japan decide to capture the oil rich Dutch East Indies (Indonesia) and to start a war with the United States and Great Britain. The stalemate in China did not stall imperialistic ambitions for the creation of a Greater East Asian Co-Prosperity Sphere. The Second Sino-Japanese War had fueled the need for oil from the Dutch East Indies. After Japan refused to withdraw its troops from China, Franklin Delano Roosevelt announced an oil embargo of Japan. With that as a pretext for war, the Japanese launched a surprise attack on the U.S. naval base at Pearl Harbor on December 7, 1941. For the next six months, the Japanese took the initiative. Hong Kong was overrun on December 8, 1941. By the summer of 1942, the Japanese had conquered Burma, French Indochina, Siam, the Dutch East Indies, and the Philippines. The decisive naval/aerial Battle of Midway in early June 1942, however, changed the momentum of the war. Japan was put on the defensive as the Americans pursued a policy of hopping from one Pacific Island to the next. Tokyo was repeatedly firebombed in 1945, and in the early spring and summer of 1945, Iwojima and Okinawa were seized by the Americans. On August 6, 1945, the United States dropped an atomic bomb on Hiroshima, killing approximately two hundred thousand people. On August 8, 1945, the Soviet Union invaded Manchuria. On August 9, Nagasaki became the site of the second nuclear attack in the history of mankind. On August 15, 1945, Japan ordered an end to all hostilities. After Japan conceded defeat, the Allied Powers occupied the Japanese empire. The Soviet Union took responsibility for North Korea as well as islands that she had ceded to Japan during the Russo-Japanese war. The United States took responsibility for the rest of Japan's possessions in Oceania. China, meanwhile, plunged into civil war. General Douglas MacArthur was put in charge of the Allied Occupation of Japan as the Supreme Commander of the Allied Powers. Japan was completely disarmed. Article 9 of the Constitution of Japan (1947) prevented Japan from ever waging war on a foreign nation. The Emperor also renounced all claims to divinity and was forbidden to play any role in politics, remaining only a national figurehead. A War Crimes Tribunal, similar to those at Nuremberg, was set up in Tokyo. Several prominent members of the Japanese cabinet were executed, most notably, former Prime Minister Tojo Hideki. 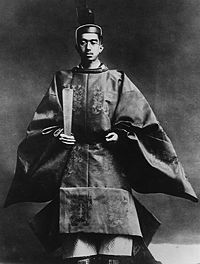 Hirohito and all members of the imperial family such as Prince Chichibu, Prince Takeda, Prince Higashikuni and Prince Asaka, were not tried at the Tokyo Trials. At the same time, the Allies also tried to break the power of the zaibatsu (business conglomerates) but were not entirely successful. Japan was democratized and liberalized along American lines, and a system of parliamentary party politics was established. Old left-wing organizations such as the Japan Socialist Party and the Japan Communist Party reasserted themselves. The two dominant parties at the time were the Liberal Party and the Democratic Party. In the first post-war elections, held in 1946, women were given the franchise for the first time. Yoshida Shigeru was elected as Prime Minister of Japan. His policy, known as the "Yoshida Doctrine," emphasized military reliance on the United States and promoted unrestrained economic growth. As Cold War tensions asserted themselves, the United States and Japan signed the Treaty of San Francisco, which came into force on April 28, 1952, and made Japan a sovereign nation once more. The Yoshida Doctrine, combined with U.S. investment and economic intervention by the Japanese government brought about an economic miracle similar to the wirtschaftswunder of West Germany. The Japanese government strove to stimulate industrial development through a mix of protectionism and expansion of trade. The establishment of the Ministry of International Trade and Industry (MITI) is widely thought to have been instrumental in the Japanese post-war economic recovery. By 1954, the MITI system was fully effective. The economic policies of Ikeda Hayato, Yoshida’s successor, removed most of Japan's anti-monopoly laws, leading to the emergence of the keiretsu , which were very similar to the pre-war zaibatsu. Foreign companies were locked out of the Japanese market and strict protectionist laws were enacted. From 1954 until past the death of the Showa Emperor, Japan rebuilt itself politically and economically. Today, Japan's economy is second only to that of the United States, and its economic power gives it far more dominance than it ever had militarily. However, despite almost forty years of continual economic growth, by 1993 (after the Showa period ended in 1989), the “bubble economy” had burst and Japan was thrown into a period of recession that lasted throughout the 1990s. ↑ Mikiso Hane, Modern Japan: A Historical Survey (Oxford: Westview Press, 1992), 234. ↑ Haruo Tohmatsu and H.P. Willmott, A Gathering Darkness: The Coming of War to the Far East and the Pacific, 1921-1942 (Lanham, MD: SR Books, 2004), 26-27. ↑ Kenneth Pyle, The Rise of Modern Japan, 189. Ike, Nobutaka. 1967. Japan's Decision for War; Records of the 1941 Policy Conferences. Stanford, Calif: Stanford University Press.